4) What's the name of the book Gale Weathers writes about the happenings in the original Scream? 6) What movie does the film class all agree was better than the original during their discussion on sequels in "Scream 2"? 5) At the start of Scream 2, the girl from the couple who go to see 'Stab' wanted to go see a different movie. Whose movie was it? 7) What horror movie do the high school kids watch at their party at the end of the original Scream? 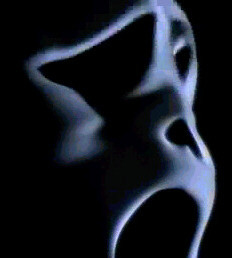 16) Which is true of Scream 1 and 2, but not Scream 3? 18) What work does Dewey do on the set of Stab 3 in Scream 3? 17) What was the name of Drew Barrymore's boyfriend in the original Scream? 19) An easier one to end the straight forward trivia. What's the name of Neve Campbell's character in the series? 20 - 21) Double your Scream Matchup! Which of these these quotes is from Scream '1', and which from Scream 2. As always, remember your answer must be a single character.